In 2014, President Obama released a plan for moving forward on his national strategy to advance U.S. security and stewardship interests in the Arctic. 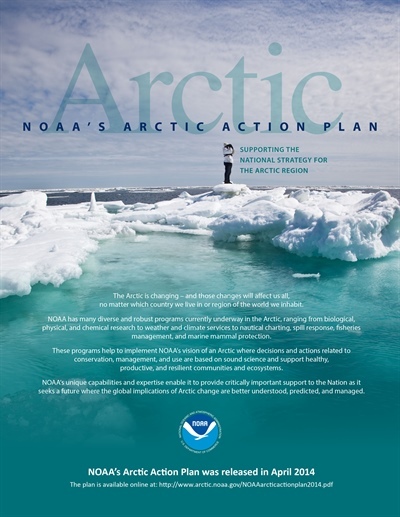 In keeping with the goals and tenets of his strategy, NOAA released its Arctic Action Plan—a document that provides NOAA scientists, stakeholders and partners a roadmap to make shared progress in monitoring, understanding, and protecting this vast, valuable, and vulnerable region. Climate change is making the Arctic a greener, warmer, and increasingly accessible place for economic opportunity. However, climate impacts such as sea ice loss and rising ocean acidification are straining coastal community resilience and sound resource stewardship. Impacts are also being studied outside the Arctic, as NOAA scientists and colleagues work to better understand the region’s influence on global weather and climate patterns. NOAA's science, service, and stewardship mission uniquely positions the agency to provide State of Alaska and Alaska Native partners, industry and community stakeholders, and federal and other local officials with Arctic environmental intelligence—timely, reliable, and actionable information that helps them plan for and adapt to economic and ecological impacts, including disasters. The document provides an integrated overview of NOAA’s diverse Arctic programs and how these missions, products, and services support the goals set forth in the President’s National Strategy for the Arctic Region. The plan also provides linkages to other agency and interagency plans crafted with constituent input, to include the National Ocean Policy, the Interagency Arctic Research Policy Committee Five Year Research Plan, NOAA’s Arctic Vision and Strategy, and more. This plan also contains an appendix listing more than 80 actions that NOAA will take in 2014 and 2015 to support our Arctic-related missions and mandates and to further our scientific understanding of the region.